After some in and out of class practice with mineral and rock id, students are divided into groups of about 5 and taken to locations where boulders and cobbles are used as decorative landscaping (usually adjacent to streets or on short slopes). This seems to work best if class sizes are about 25 or less - then instructors can keep track of groups in an area. Groups are given an area about 5 feet wide and 25 long (enough for several hundred cobbles/boulders) and told to identify 6-12 rocks of different types (at least 2 each if only doing Ig, Met, Sed.- more if rock names expected). 1.) In the first stage groups are given a fairly long time (~20-25 minutes) to pick and identify rocks with flags and markers. This seems like a long time and normally they can quickly flag and name the easiest rocks in their area. However, they only get one point for each rock correctly identified at this stage. 2.) In the second stage groups get 10 minutes to inspect all other groups' areas and mark those rocks they think other groups INCORRECTLY identified. They are allowed to send one person from their group to inspect each of the other groups' areas. Their group gets 5 pts for each correctly mis-identified rock of another group. 3.) In the third stage, groups can defend their identifications to the instructor/TA and get 10 points if they prove that another group flagged/id'd one of their identifications incorrectly - the mistaken group gets docked 10 points. 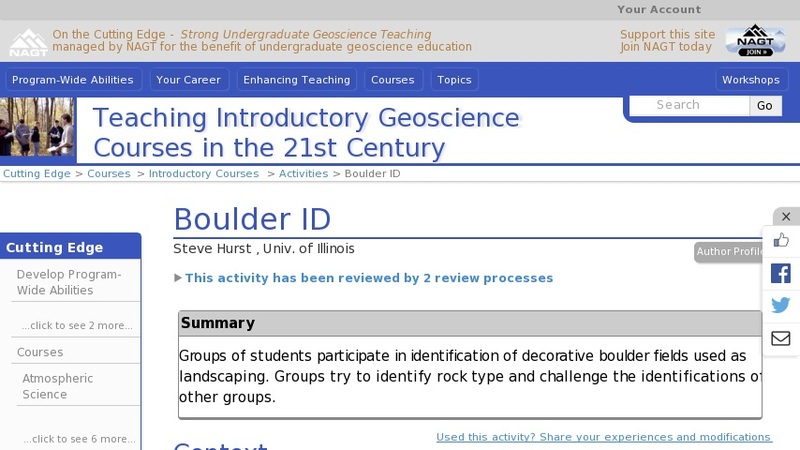 The key to this exercise is that in the first stage some of the students should realize that they get many more points for making other groups mis-identify their rocks, and that all of their own group members should be trained to have enough expertise to identify tricky or difficult rocks. This is the reason for the excess time at the first stage, for training, review, and typically the group will change their chosen rocks to include the most difficult ones rather than the easiest. Should groups not realize this - the instructor might want to prompt them.Students are allowed Rock charts, cheat sheets, etc. at the instructors decision.